Across the Gold Coast, security is a significant concern of many homeowners. It is not always easy to balance security with design, however, and many mass produced gates can give your property a sinister ambience that is not compatible with the design features of your home. 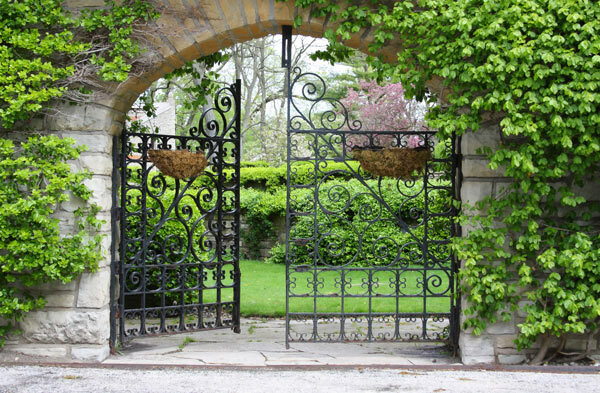 Here at Dean Wilson Iron, we have developed a comprehensive range of solutions to address this issue and our range of custom made, designer wrought iron gates are perfect for homeowners looking to combine timeless elegance, with great security. We think that security should not come at the expense of design and we specialise in crafting intricate and striking designs that will give your home a unique air of grandeur and prestige; something that simply cannot be provided by substandard, mass produced gates. To ensure that you are getting the most unique, high quality solutions we use wrought iron to handcraft our gates exactly to your specifications. We have found that wrought iron is the perfect substance for these applications, as it is secure, durable and can be fashioned into striking designs. 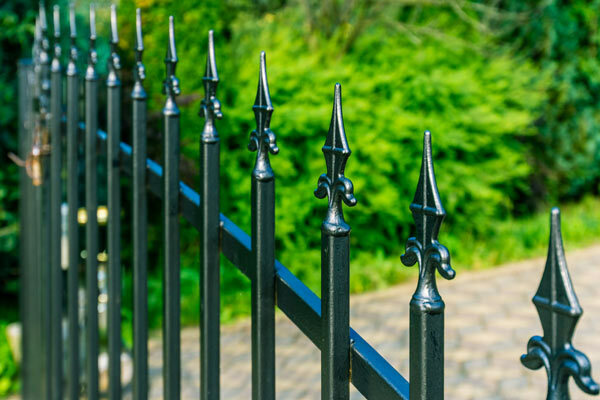 The strength of wrought iron is what guarantees its security, as it is capable of withstanding considerable force, meaning that any potential intruders will be deterred from attempting to enter your property. Its durability comes from its ability to withstand the climate; we finish our wrought iron to ensure that it will not rust no matter how long it is exposed to the elements. 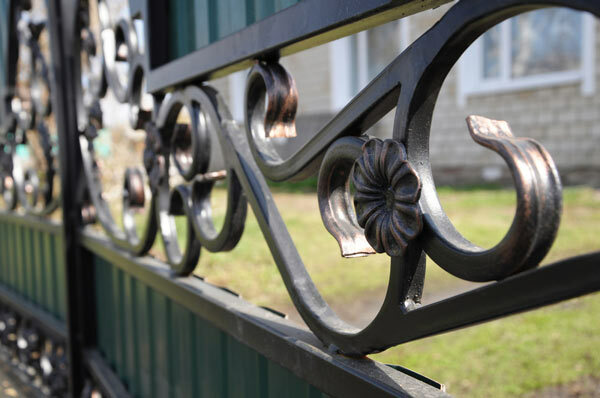 Because of wrought iron’s malleable properties, our team is able to use their skills as blacksmiths to craft incredibly detailed designs that will be the envy of your neighbourhood. We work in close consultation with every one of our clients to create a gate that is perfectly fitted to their exact purposes; no job is too big or too small. We can craft all gates whether it is a grand and classically designed driveway gate, an elegant and contemporary pedestrian gate or anything in between – we even do pool gates to give your pool area a unique and designer edge. To create a true presence in your entry to your Gold Coast home there are few better options than hand crafted and styled wrought iron gates. The Gold Coast’s most unique, handcrafted wrought iron gates? Gates can have a considerable bearing on the ambience of your home and they are often used as an effective design feature by architects and designers alike. For this reason, it is important that your gate is crafted for your exact purposes. Here at Dean Wilson Iron, we believe that your gate should reflect your own personal style and we specialise in working with our clients to develop designs that will complement the design of your home, whilst maintain uncompromising quality, durability and practicality. We work closely with you throughout the entire process to ensure that your design concept is brought to life – we encourage your input and welcome the opportunity to discuss specific points of your gate, so as to ensure that you are getting a perfectly targeted solution. We provide a comprehensive range of gates that can account for all of your needs – whether they are security needs, designer needs, practical needs or all three. Wrought iron is renowned for its timeless and classical appearance, however this does not mean it cannot be used in contemporary circumstances. We strive to combine practicality with design and to do this we can incorporate leading edge technology into the design of your gate. Unrivalled strength and durability, to give you many years of security and design appeal. Attractive designs, which are sure to be the focal point of your home. Unrivalled security that keeps you in control. Automated electronic systems so you can exit and enter your property with ease. Here at Dean Wilson Iron, our clients are the foremost of our priorities; our services are aimed at developing a personalised and targeting solution to your situation. To do this, we engage with you throughout the entirety of the process to establish a clear idea of your needs. We will keep you updated throughout the design stage and the construction of your gate, to ensure that your needs are met. We like to begin with a detailed discussion of your needs, as this allows us to develop an idea of what is needed to provide you with the best gate. During this consultation, we can address any design concepts you may already have and offer you with some guidance on how to implement your perfect design in the construction of your gate. We also encourage you to outline any of your concerns during this consultation, so that we can clarify any points of confusion for you. Once we have discussed your design preferences and some approximate measurements, our team will be able to provide you with a rough quote for the work, so you can consider your options. Once we have developed a rough design with you, we can assess any additional features that we can add to your gate. We have a comprehensive range of technology that can enhance both the practicality, convenience and security of your home. Our team has had a great deal of experience working with wrought iron and developing security solutions and we are well equipped to incorporate automatic technology into your gate’s design. We can fully automate your gate with electric motors, intercom systems and electric release strikes; we can include electronic locking systems as well. This guarantees you the upmost in security, as well as great convenience that will not compromise on design. Here at Dean Wilson Iron, we custom make every one of our gates exactly to our clients’ specifications. Our team has a wealth of knowledge and expertise that allows them to bring your personal design concepts to life and we will perfectly tailor our wrought iron solutions to your home. We will use precise measurements, coupled with your personal requirements and design specifications, to create a gate that can be installed perfectly to any part of your home or property. No job is too big or too small; our experts can customise your gate to any size or situation in a manner that ensures striking aesthetic appeal, unrivalled quality and uncompromising security. If you are interested in exploring your options, then we encourage you to contact us today. Our team can guide you through the process and work with you to develop a unique and personalised design for your gate. Alternatively, if you would like to peruse some photos of our work across the Gold Coast, or are simply interested in asking some questions, then we can be found on Facebook. #1 Will my gate require much maintenance? As with all fittings in your home, your gate will require some minor, periodical maintenance, however very little will be needed to keep it in immaculate condition. Our gates are built to withstand rust and corrosion, whilst maintaining a perfect finish. We sandblast all our wrought iron products before applying a zinc coating and a decorative powder coat or hand-rubbed natural iron finish, to effectively safeguard against rust for years to come. #2 How do I develop a design for a gate? Creating a design for you gate can be a challenge for those without experience, which is why we work with you throughout the process to develop your design concepts so that they can become a reality in our wrought iron workshop. We are well placed to help you create a designer masterpiece that will perfectly complement your home and your personal style. #3 How long does your manufacturing process take? Unlike many of our competitors, we handcraft every one of our wrought iron gates and because of this, we suggest allowing as much time as possible. Typically, it takes us 6-8 weeks from design to completion and we have found that this much time is usually sufficient for us to create a wrought iron gate that is unmatched in quality and design. #4 Do you offer any guarantees on the quality of your gates? All of our gates are designed with the intention of not only looking great, but also lasting you for many years. We pride ourselves on crafting durable, high quality wrought iron gates and we stand behind every one of our products. Because of this, we offer a ten-year guarantee on our wrought iron gates to protect against rust, installation and manufacture.